I’m sure every single one of us has heard of the phrase “simplicity at its finest” at one point or another in our lives. Now, this is something that would relate to all of us because oftentimes, we overthink on things that we tend to forget what really matters. This phrase is telling us not to complicate things because simplicity is already capable of making it look fine. And, to avoid creating confusion between this and “settling for less”, the former refers to simplifying things if there is no need to make it more difficult, while the latter refers to being lazy and not bothering at all. 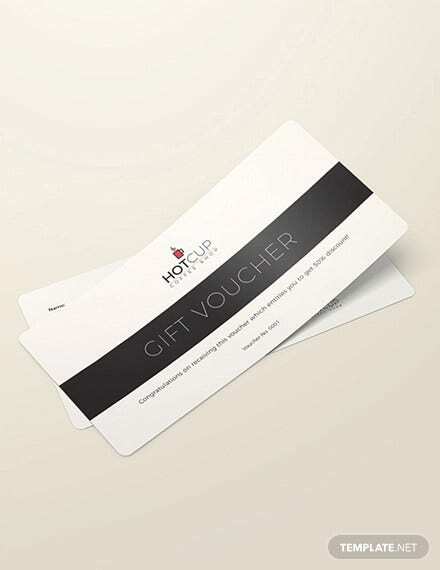 You can also check out modern gift voucher templates. 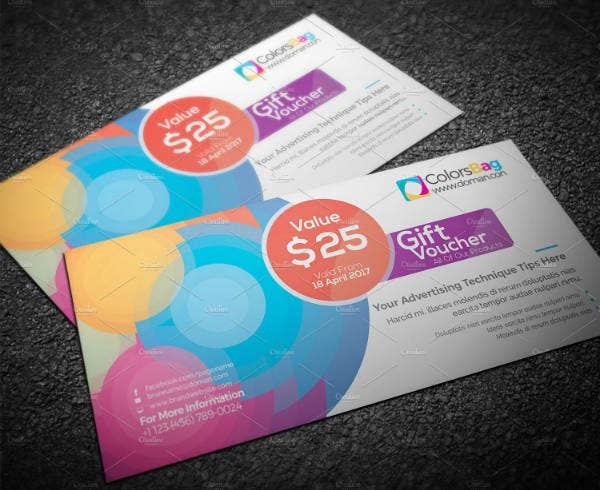 The same idea can be applied to graphic designs and gift vouchers in particular. Why bother complicating things when what matters most is the actual content of the voucher. 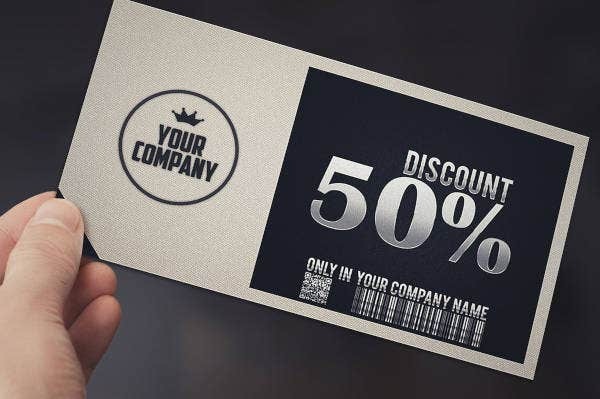 As long as the numbers and the other relevant information are legible on the voucher, you can let people use it when they buy something or avail the services of an establishment. 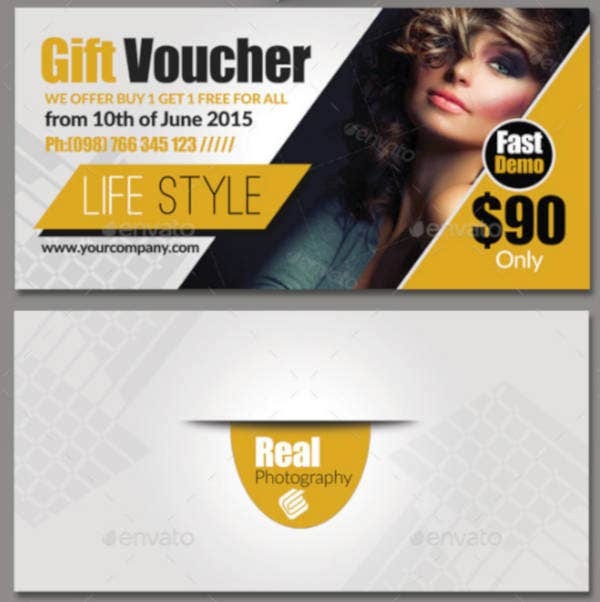 Below, we have a collection of gift voucher designs and templates that we have gathered from various websites. If there’s one thing that you will notice from these templates, it’s that all of them have a rather simplified design. I know your mouth is starting to water just by looking at the images used on the sample designs above, and it is pretty understandable why. But what you should be amazed about is not the images on the design but the design itself. Take a very good look at how magnificent it is despite its simplicity, and the best thing about it is that you can use it not only for food establishments but also for any type of business as well. 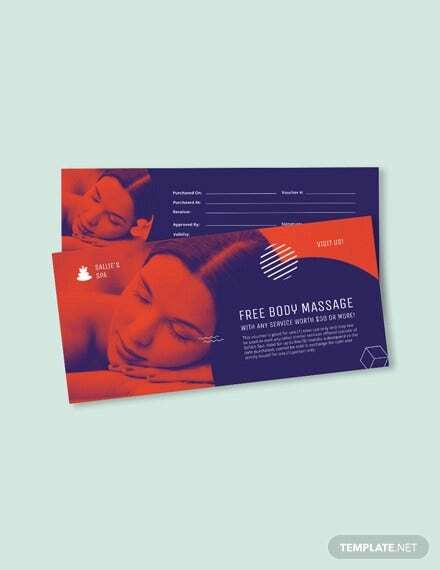 You can also read massage voucher templates. This template is in PSD format, which obviously means that you will need to use Adobe Photoshop for this, just make sure that your Photoshop is CS5 or better. Additionally, this voucher template comes with two designs intended for both sides of the paper stock, and a few free fonts that you can download separately. 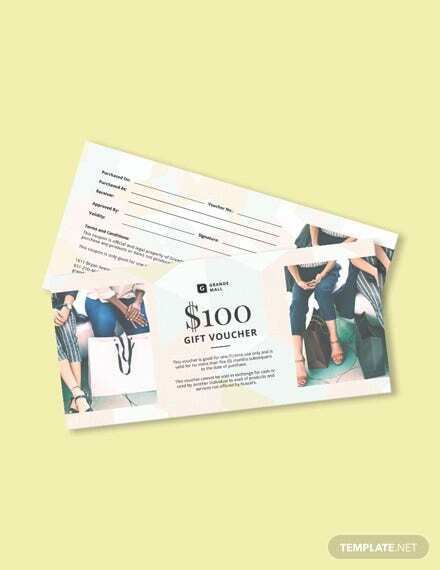 In fashion industries, one good way to promote their apparel is through vouchers, and they can either use them when they have a new line of products or during special occasions. The discounts applied from vouchers may either come in percentage form, or they may also come in a specific amount such as the ones shown above. This way, people will want to buy from you knowing that they’ll be able to get them for a lower price. This template comes in fully editable PSD and AI file formats, and if you haven’t known yet, AI files should be edited using Adobe Illustrator. So if you’re running a fashion business and you wish to use vouchers, feel free to use this simple voucher template. 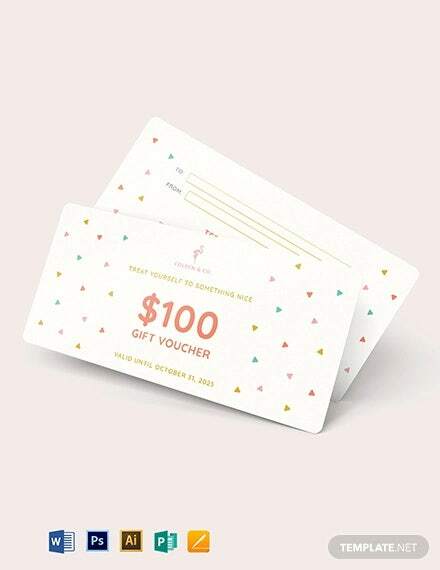 If you’re looking for something simple but also very functional regardless of the purpose, then you might want to consider downloading the multipurpose gift voucher template shown above. Whether you’re using it for food products, fashion pieces, or anything, this template is highly editable and versatile that you will simply need to modify the design a little bit in order to make it work. This template can be downloaded in multiple high-resolution formats: EPS, AI, and PDF, so just choose which format is more convenient for you. Also, take note that while this template actually doesn’t come with the graphical elements shown on the sample above, it does come with fonts provided by Google themselves. 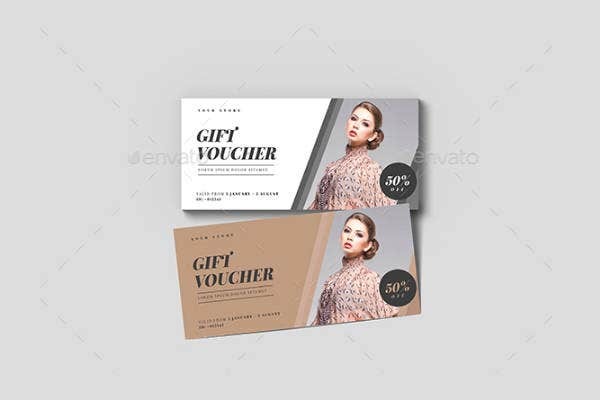 Here’s another fashion-related gift voucher template that you may also use for promoting your business and products, but unlike the previous template that you have just seen, this voucher template makes use of the percentage discount. Earlier, we mentioned that the discounts may come in either percentage or a specific amount, and the best thing about having it in percentage form is that it allows for bigger savings if the original price is high. Also, take note of the design of the sample above, this template is a lot simpler than the previous one but still manages to serve its purpose effectively. This template comes in fully editable PSD and AI files, you can edit all of its elements including the color, size, text, and icons. You may also see sample business vouchers. What Are the Different Types of Vouchers? Vouchers can be classified according to types, but this is entirely different than what we mentioned earlier regarding the two types of vouchers. Those we actually two ways on how vouchers offer their discounts, while these ones differ according to their use and/or purpose. So, the next time you decide on using a voucher, take note on where it is meant to be used, and what you can avail from it. 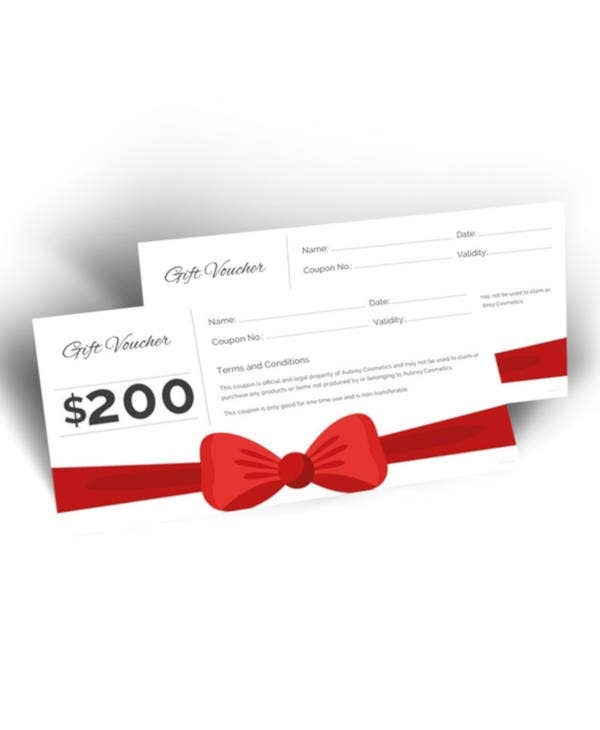 A sample gift voucher is a type of voucher that can be used to buy certain goods or products for a lower price. 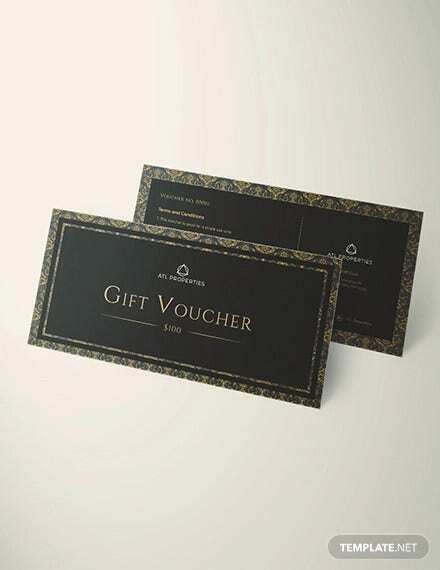 Alternatively, gift vouchers may be given to another person as a present. Since no change will be given if the item bought has a smaller value, the best way to make the most out of your voucher is to buy something that has an equal value. Additionally, you may be allowed to buy something that has a bigger value and just pay in cash for the remaining amount. 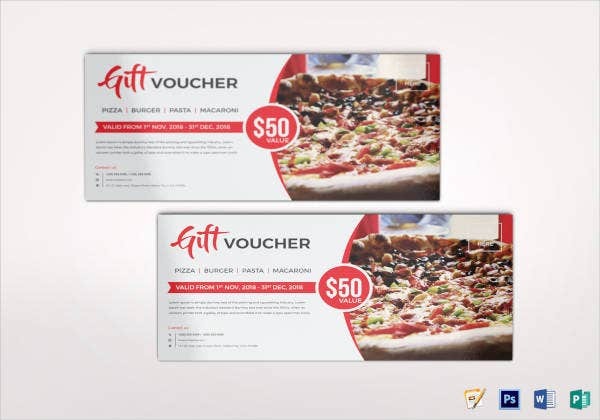 A type of voucher that is usually given to workers as a form of incentive. 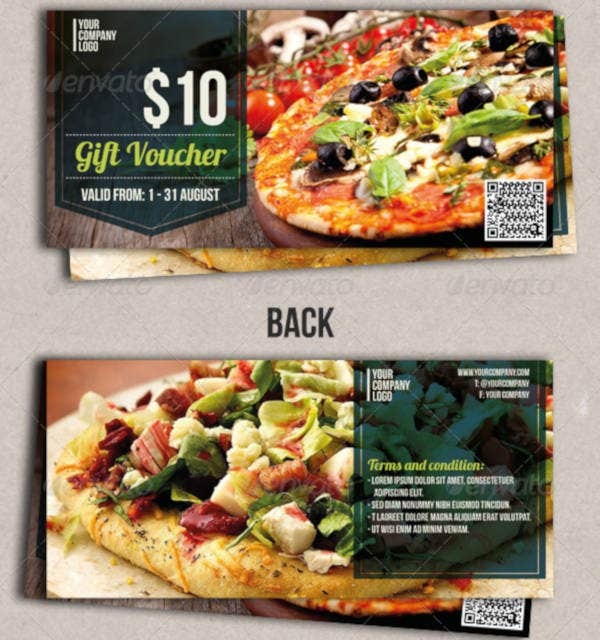 This voucher will them the privilege to dine in a restaurant or food establishment indicated on the voucher. Also, there are some meal vouchers that only offer discounts instead of an entirely free meal. 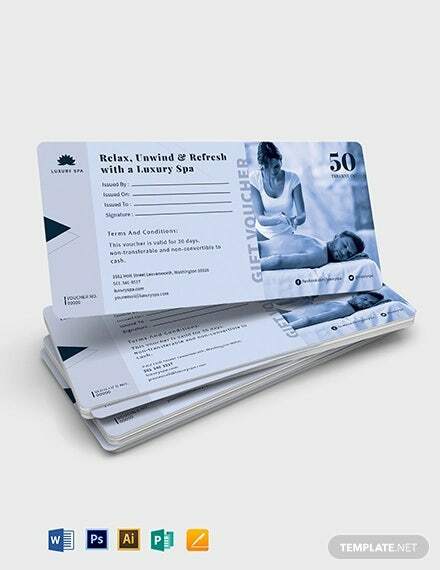 Otherwise known as a travel voucher, this type of voucher that is commonly used in the tourism business, and acts primarily as a written document to prove that the person whose name is indicated on the voucher has the right to travel to a specific place within a specific time frame. A type of voucher that replenishes the sim card with monetary value—or balance—in order to extend the services that a user has availed. These vouchers can be easily bought from phone stores, gas stations, grocery stores, or retail outlets. 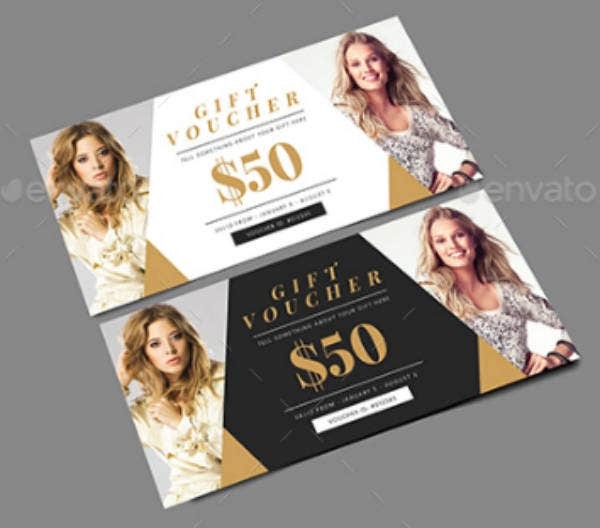 Also known as internet voucher, this type of voucher will simply need to be inputted on to the computer when buying something online. This type of voucher comes in an alphanumeric code, but will often be mixed up with symbols other than letters or numbers. Electronic vouchers are common in video games wherein it allows the player to download exclusive contents of the game, but these are usually only given to those who have pre-ordered the game. A type of voucher that is usually issued by the government to cover the educational expenses of a student. Depending on the state, some school vouchers cover an entire school year while some only cover a specific semester. In some countries, school vouchers are meant to reimburse the expenses made by parents for home schooling their child. You may also read simple restaurant gift vouchers. 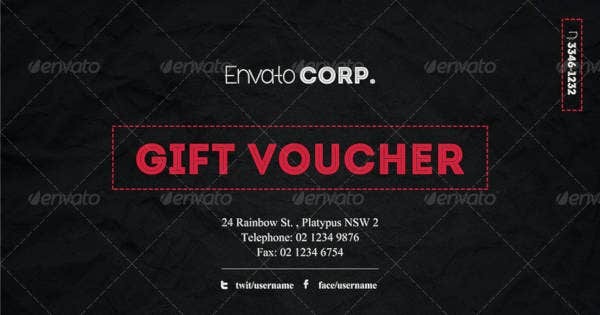 Looking for a gift voucher template that’s clean and simple? 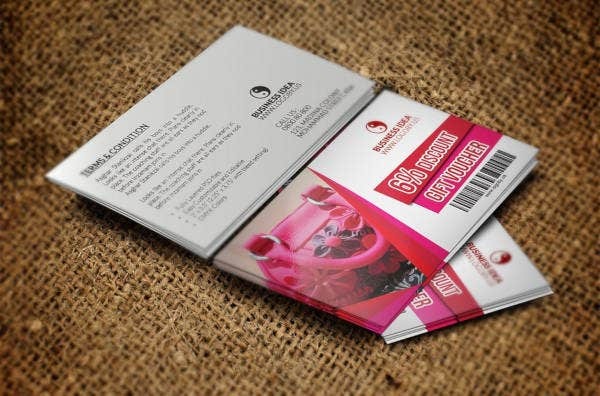 Here’s a perfect match, and while the sample design on the template shows a photography business being promoted, you can actually use this template to promote any type of business. This template offers a smart, creative, layered, and high quality design that’s fully editable with just a single click of a button. 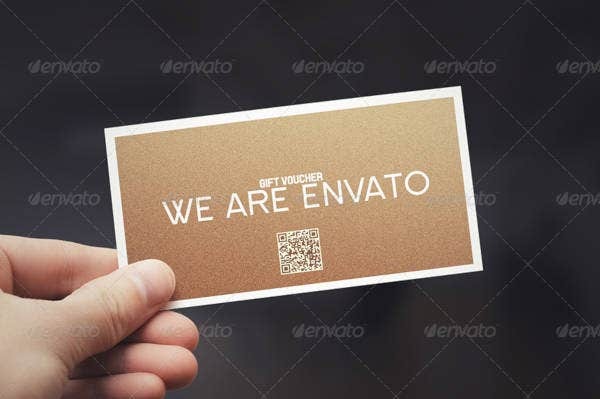 The PSD file in this template consists of two pages intended for the front and back sides of the voucher, and it also comes with a free font as well as links for downloading photos. 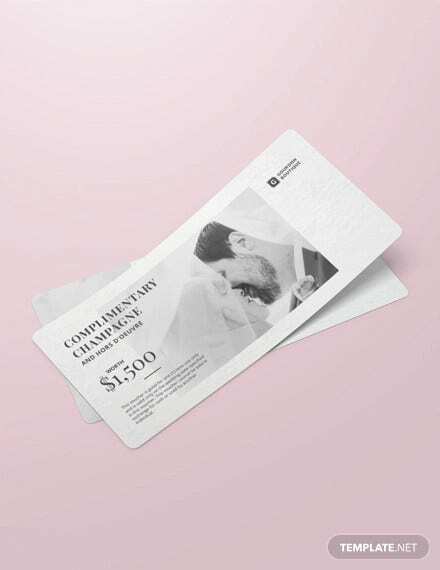 Keep it simple, keep it direct, and this voucher template will let you do that. 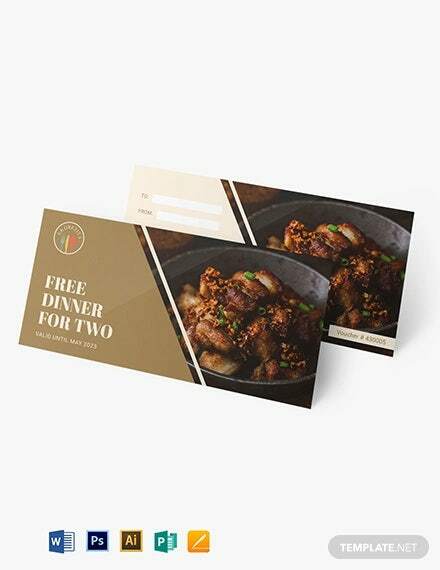 As you can see from the sample above, the entire design is divided into two parts only, the blank half on the left is for the business logo, and a solid-colored half on the right is for the other details of the promo. 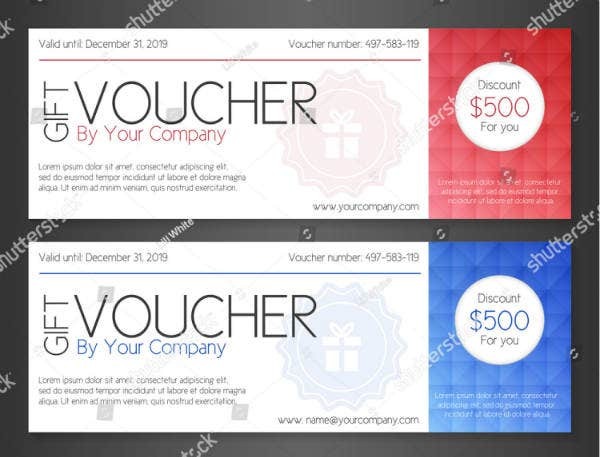 Even with this voucher template’s simple design, it will still be able to convey its relevant information to its reader, and that’s what matters most. 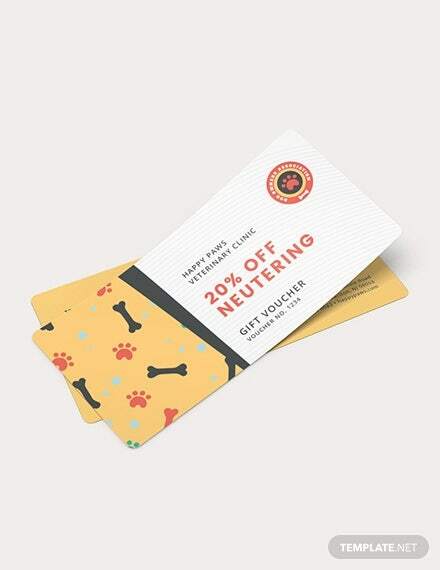 If you think it’s crazy to combine the concept of vouchers and postcard designs, it is surprisingly not uncommon. 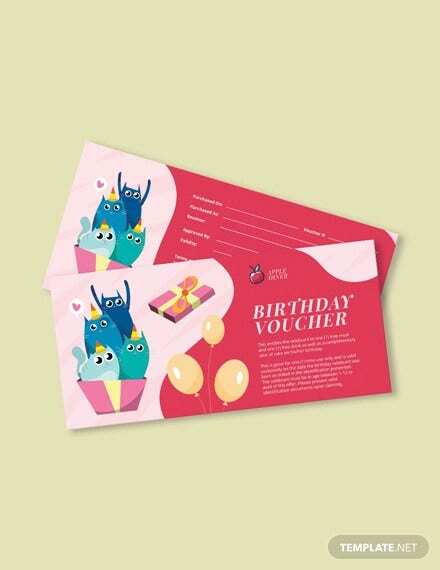 You can actually make your vouchers multipurpose, meaning you can use it as vouchers but at the same time, use it as post or greeting cards. To give you an idea on how this might turn out, check out the template shown above. For this template, it comes in the PSD format and is guaranteed to be editable and easy to use. Black and red go very well together, the darkness of the black is able to compliment the red and make the elements stand out. If you’re looking for a dark-themed minimal voucher template, then you might want to use the one provided above. For only $7.00, this template comes with two layered PSD files that are both fully and easily editable, and not only that, free fonts are also included in this template. If you don’t feel like using red-colored elements for this template, you can always go with the blue or yellow alternatives. 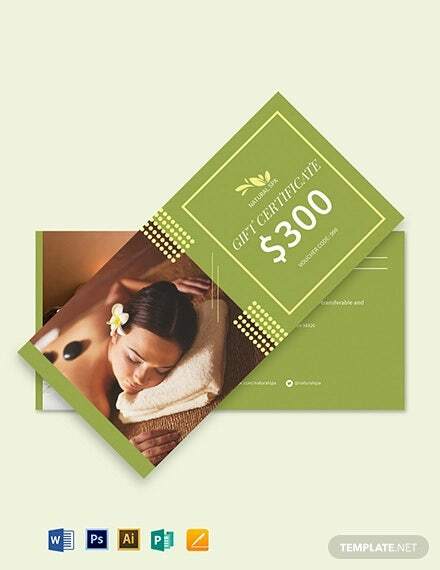 If you feel like going all textual with your vouchers but find the solid-colored background to be too dull, you can always incorporate a texture effect to enhance the design a little bit. 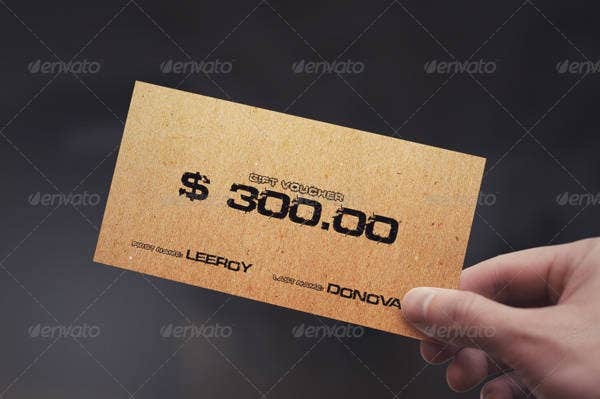 With the simple gift voucher template above, the design actually resembles a real card board, and is enough to add a little bit of enhance to the template design. This template comes in two editable PSD files that are both layered, and two fonts that you can use for free. You can also check out sample vouchers.